In June of last year, Starburst finally released a bag filled with solely pink fruit chews (we only begged and pleaded for it for, what, several years?). Now, Starburst is wasting no time releasing what might be their next best product. 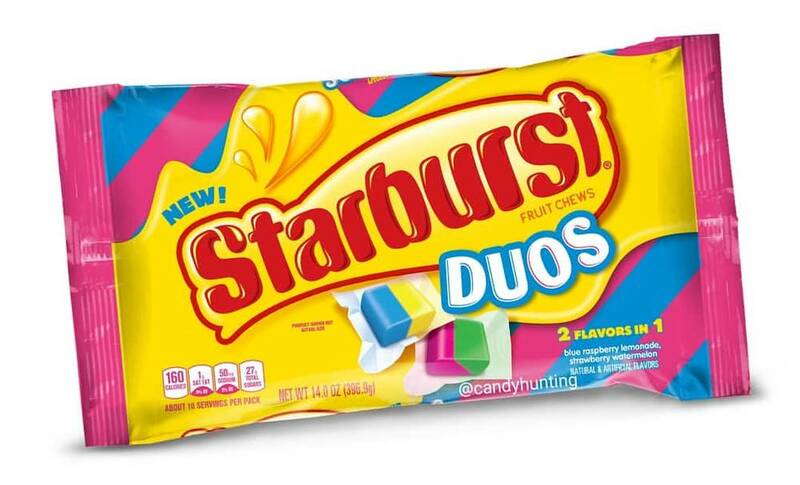 In January 2019, Starburst will release Duos, which features two popular flavors packed in one bite-size treat. 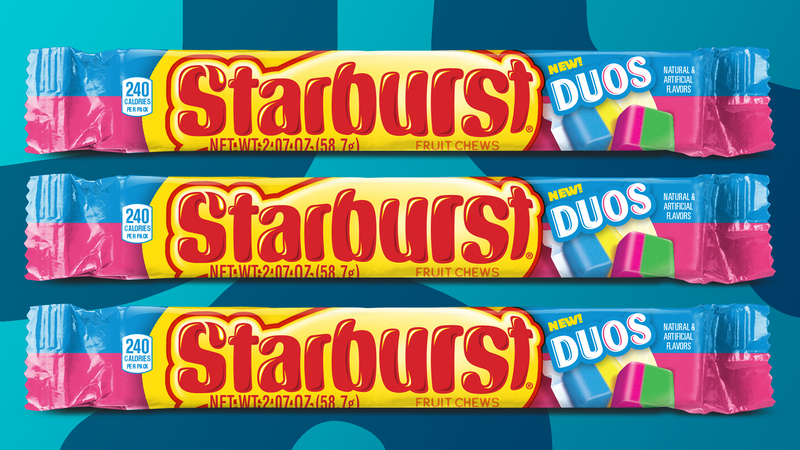 As one might guess, Duos are half one flavor and half a different flavor, and Starburst is certainly kicking it off with two refreshing duos: strawberry-watermelon and blue raspberry lemonade. They'll be available in a single pack for $0.99 and a 14-ounce bag for $3.19. In early October, Mars Wrigley Confectionery — which owns many of your favorite candies and snacks, including Starburst, 3 Musketeers, Combos, M&M’s, Skittles, Snickers and Twix — announced a ton of new flavors across its candy offerings. For starters, 3 Musketeers is releasing its first new flavor in six years, birthday cake, which will be available nationally in Walmart in January 2019. M&M’s hazelnut spread will launch April 2019. M&M’s will also launch new bars in five flavors at the end of this year: peanut, milk chocolate, crispy, almond and crispy mint. Skittles Darkside, which contains dark berry, black cherry, forbidden fruit, blood orange and midnight lime flavors, will be available January 2019. Creamy Snickers will hit shelves in December 2018. Twix triple chocolate, which features chocolate cookies and chocolate caramel covered in milk chocolate, will be available December 2018. Halloween may be over, but that doesn't mean we don't still want all the candy. Keep 'em coming, Mars Wrigley Confectionery.